"I FOUND this recipe in the newspaper many years ago. It has been a family favorite ever since. Since it goes well with any meat, it's a good 'dish to pass' for family gatherings or potluck suppers. Someone will always ask 'Who brought the onions?' -Louise Elliott, Gallipolis, Ohio"
Slice onion and separate into rings; place in a greased 1-qt. baking dish and set aside. In a small saucepan over low heat, melt the butter. Stir in the flour and salt until smooth. Gradually add milk; bring to a boil over medium heat. Cook and stir for 2 minutes. Remove from the heat; stir in cheese until melted. Pour over onions. 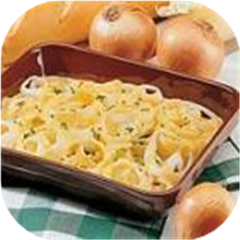 Bake, uncovered, at 350 degrees F for 45-50 minutes or until onions are tender and cheese is browned.